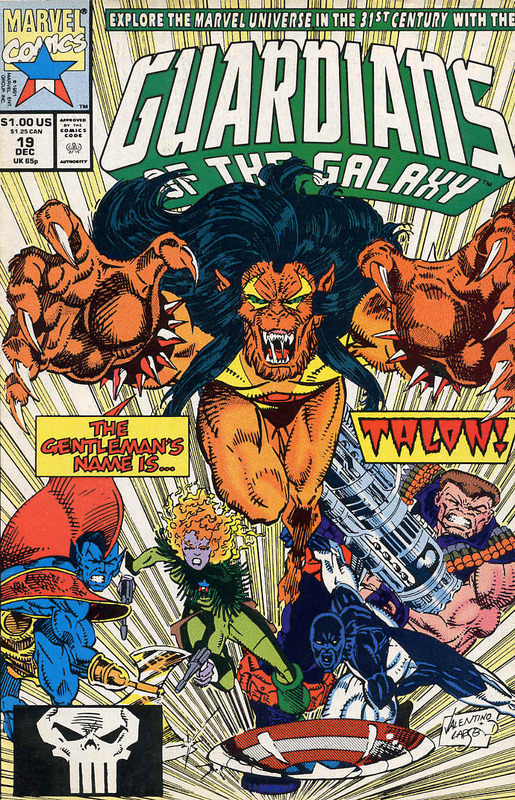 Guardians of the Galaxy 20 was cover dated January 1992 and was on sale in November 1991, sharing the spinner racks with Aquaman #2, Daredevil #300, Elongated Man #1, New Warriors #19, Superman #63 and Wolverine 50. 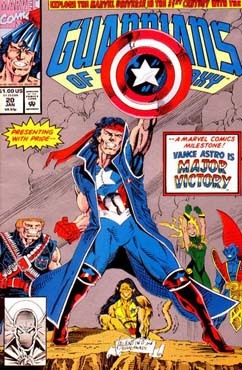 Major Victory was written and pencilled by Jim Valentino and inked by Steve Montano and opens with a containment-suit-less Vance Astro leaping into the tense stand off from last issue and helping the Guardians of the Galaxy and the Commandeers turn the tide on the Punishers and the Badoon. 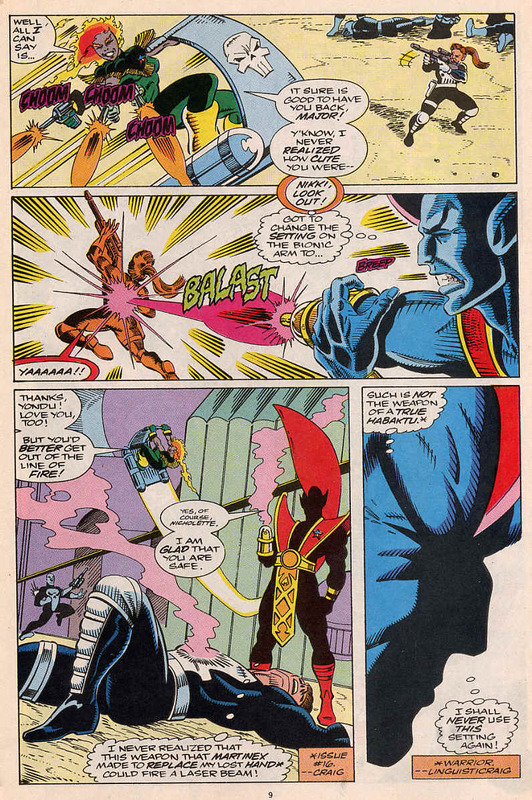 With the one of the two Badoon dead and the other running, the team give chase and ask Vance how he is free of the containment suit he needed to survive, only a day ago. Krugarr the Sorcerer Supreme, used Hollywood’s ionic blood and some magic to heal Vance and cure his skin so that it wouldn’t oxidise on contact with the open air. 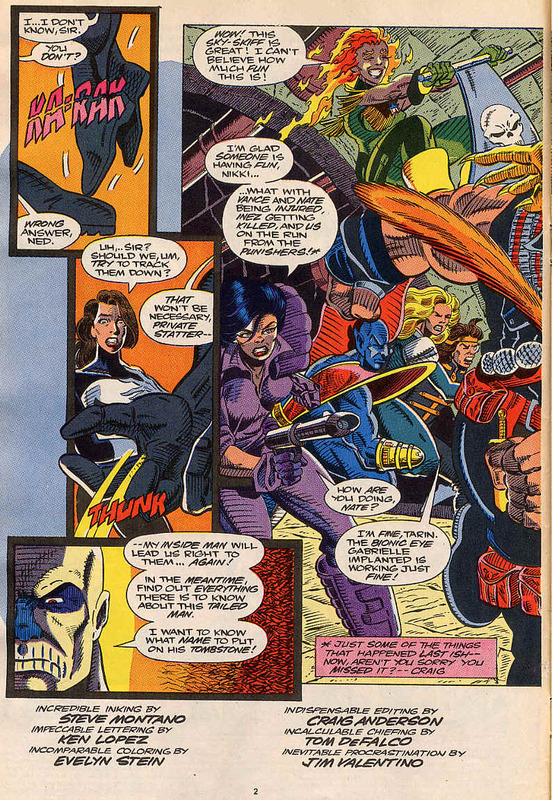 The Guardians face off against the Punishers and cut a swath through them. Gabrielle of the Commandeers shoots Belle in cold blood for the betrayal that cost Inez’s life and to save Nikki, Yondu uses a laser weapon from his artifical hand to kill one of the Punishers, being a Habaktu, Yondu feels ashamed about this use of a technological weapon and vows never again to use it. 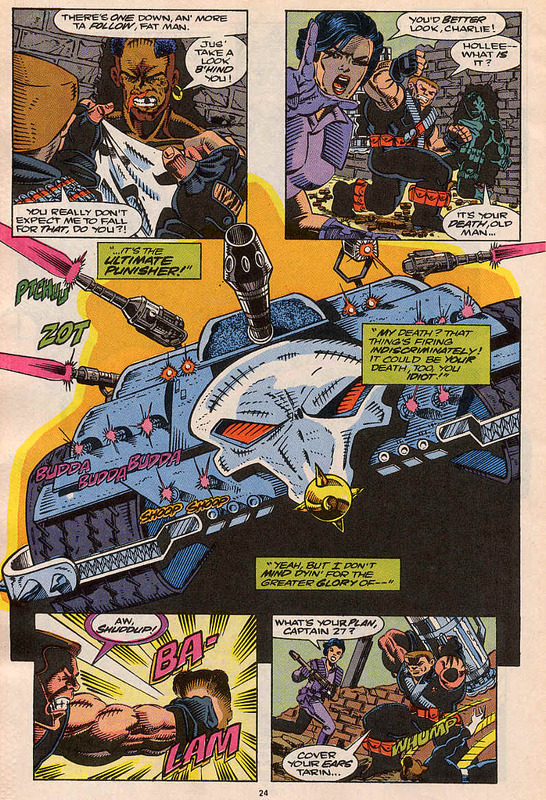 The Punisher General flees and along with the surviving Badoon, makes it to the Ultimate Punisher tank. Before they can drive off in it, Hollywood lifts it over his head and throws it. Krugarr catches it and teleports them to the centre of the complex. 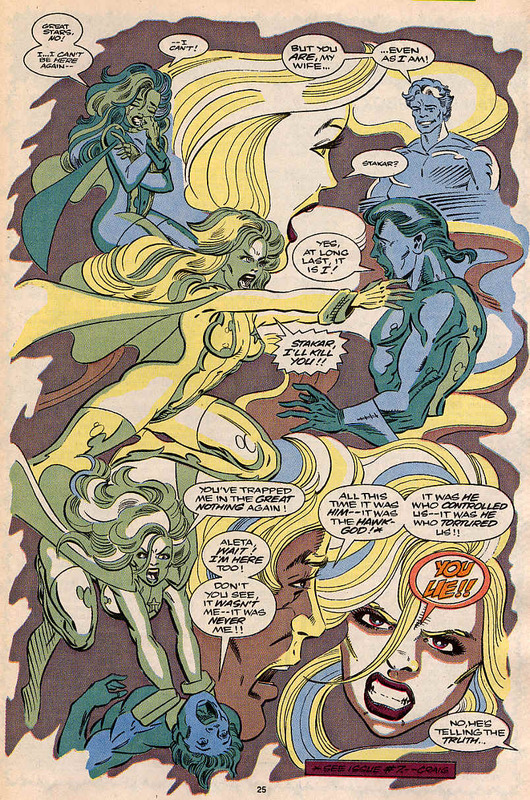 The scene shifts to space and the glowing form of Starhawk where Stakar tries to convince Aleta to give up her claim on their shared body by giving her a simulation of her old family. She is happy to see them and seems to forgive Stakar for his part in their apparent deaths, but then realises that since Starhawk re-inhabits his own body time and again, there is no Stakar and it’s all Starhawk and she begins fighting for her body again. 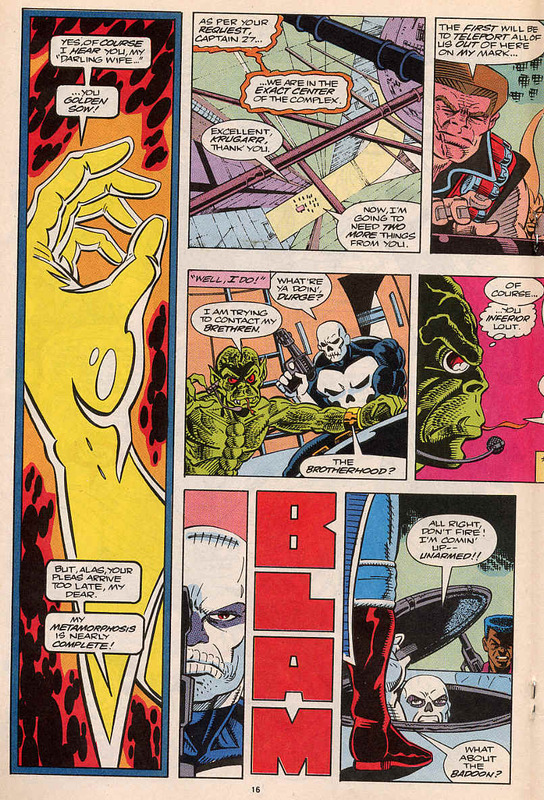 At the centre of the Bronx refinery, Charlie-27 rigs his cannon to go nuclear and take the refinery out, inside the tank, the Badoon tries to call the rest of the Brotherhood, but the Punisher General kills him and leaves once he realises that the Guardians will detonate the gun. Once he exits, Gabrielle shoots him in cold blood too and the Guardians escape before the gun blows, destroying the facility and ending the threat of Realiteevee. 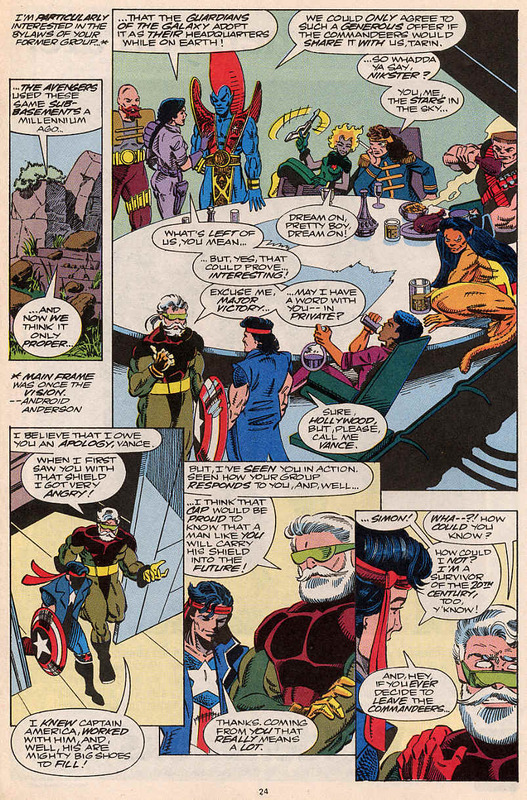 There’s a brief scene with Martinex on Mainframe’s world trying to work out how his Galactic Guardians concept will work, while back on Earth, the Commandeers offer Vance’s team use of the sub-basements of Avengers Mansion. 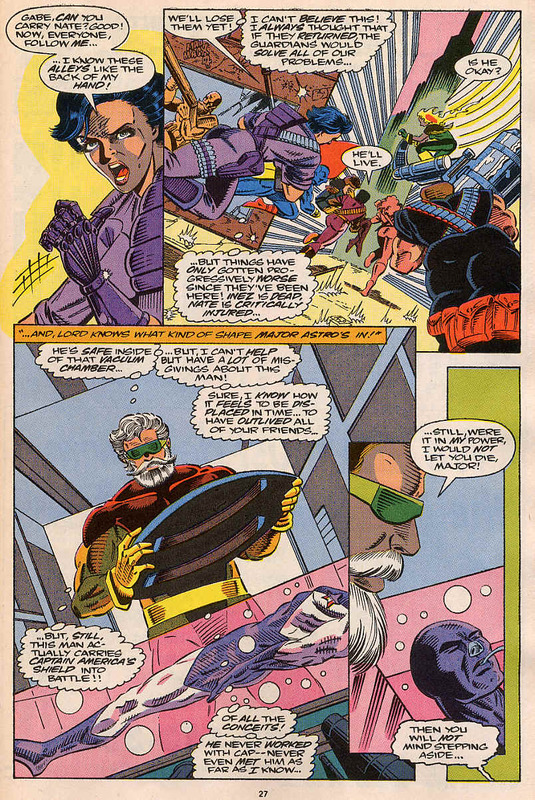 Vance takes a second to point out that he recognises Hollywood as someone called Simon, clearly Simon Williams or WonderMan, who was an Avenger as well as an actor. 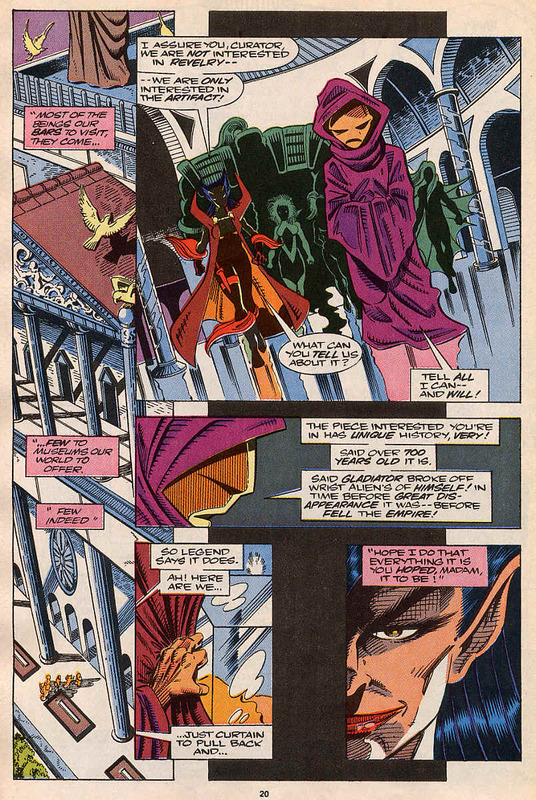 This pretty much brings the story to an end, with Talon being offered Guardians of the Galaxy membership and a nice little pin up page. Then we’re shown what’s coming next. Rancor and the Mutants of Haven find that their search for Wolverine will lead to Earth. Notes: Thus ends the era of the containment suit and begins the age of Major Victory. 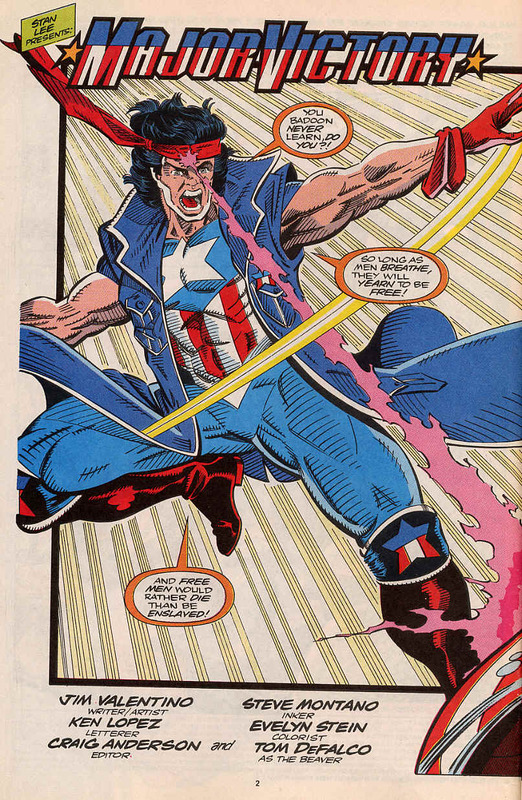 This was a sort of third act of the story, with the team given that last minute boost and that hero moment of Vance Astro flying into the action and changing the course of the battle. You can almost hear some kind of orchestral overture as he jumps in. Gabrielle executes someone twice and is only brought up about it once. 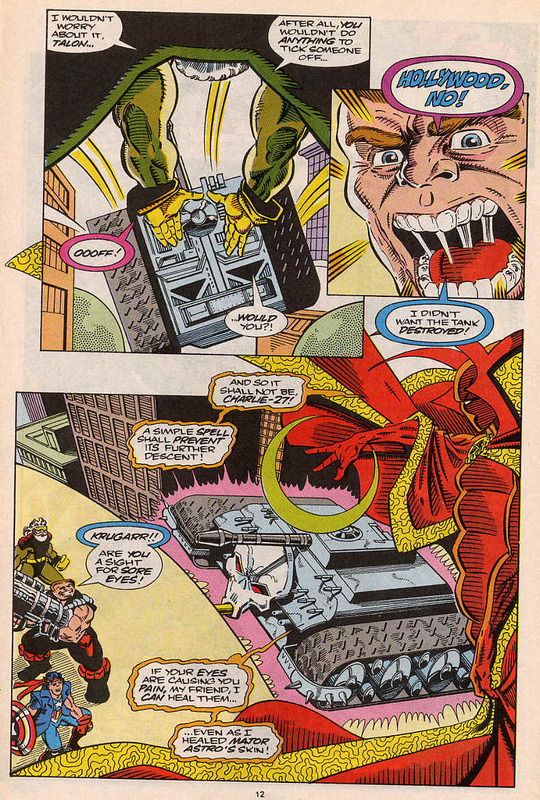 This highlights the difference between the Commandeers and the Guardians of the Galaxy. 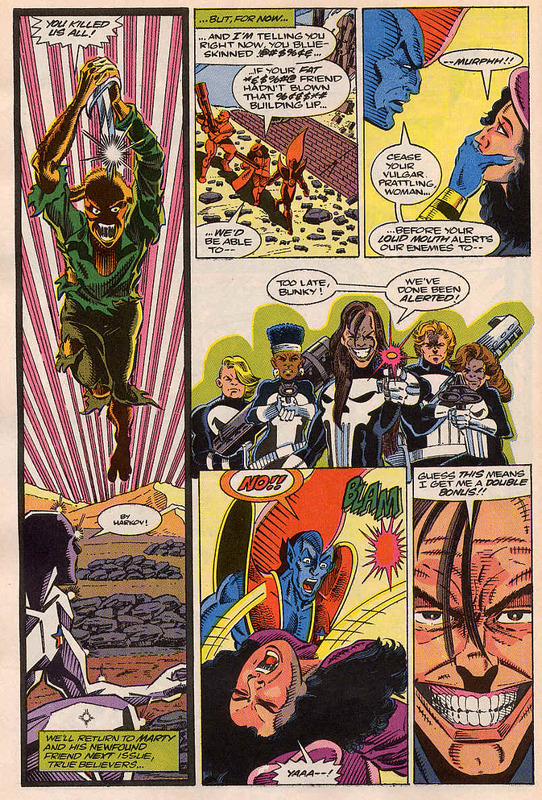 The Guardians are more of a super hero team, changed by their experiences and choosing to show restraint and mercy. The Commandeers however, are soldiers and very much still in this war. Gabrielle does what a soldier might do, but Vance’s reaction shows that for him that feeling was a long time ago. Rancor is back, not thrilled exactly, but there are half decent stories coming. Talon is offered membership and stays with the team for the rest of this volume. Did everyone get the Wonderman thing? I suspected at the time, but even when it’s revealed there’s no real mention of his name, just that he’s called Simon. 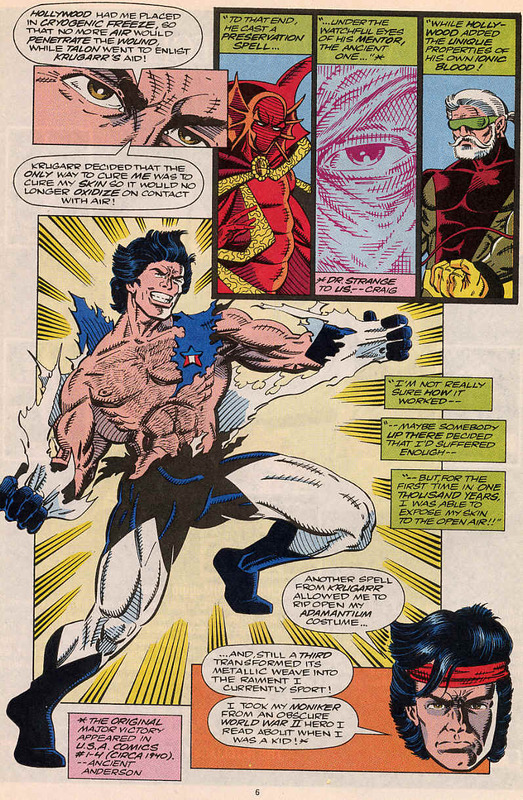 Starhawk consolidates his control over Aleta and that will be brought back in the next issue. Next time: The Return of Rancor. Guardians of the Galaxy 19 was cover dated December 1991 and was on sale in October 1991, sharing the spinner racks with Aquaman #1, Excalibur #45, Human Target Special #1, Iron Man #275, Robin II #1 and Sensational She-Hulk #34. 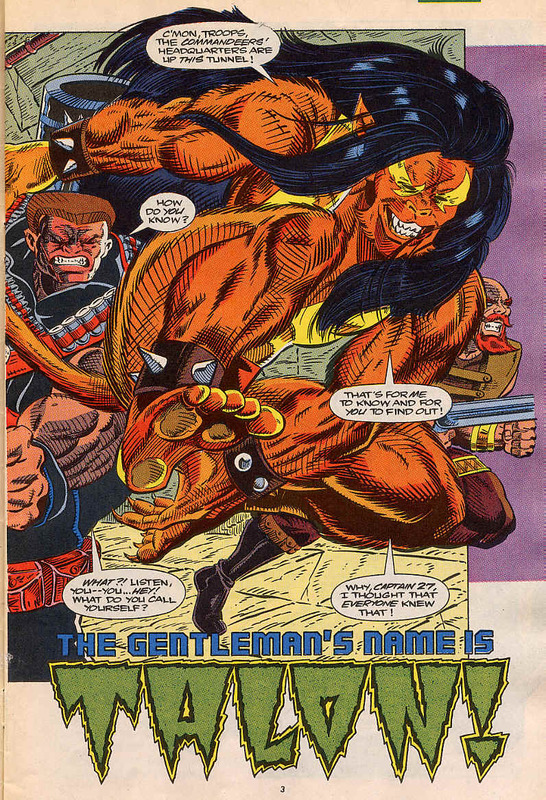 The Gentleman’s name is Talon was written and pencilled by Jim Valentino and inked by Steve Montano and opens with the Punishers surveying the devastation from the previous issue and the Guardians escaping through tunnels. 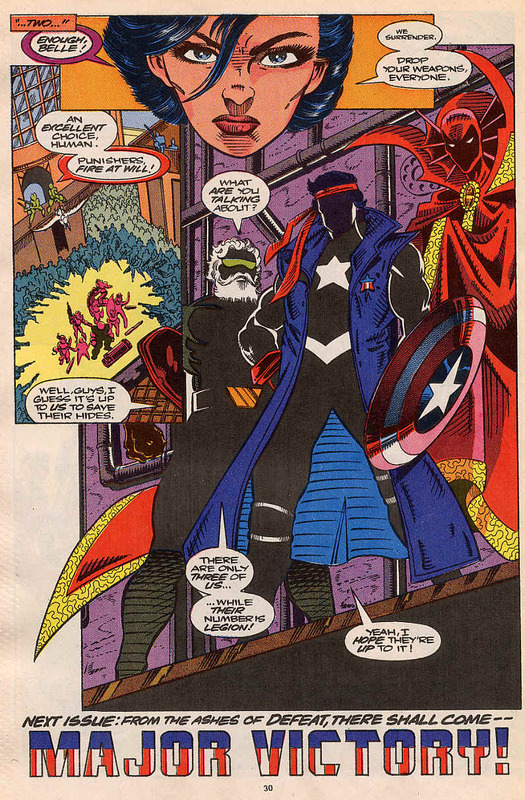 The huge Punisher general kills the sniper who shot Vance Astro in the previous issue and demands to know about the man with the tale, commenting that they have an inside man and finding the Guardians will not be a problem. In the tunnels, Charlie-27 demands to know more about this furred ally and gets knocked on his rear end for his trouble. Talon then and shoots Charlie-s hand with claws As a fight brews, Yondu steps forward to end it, once more being the voice of reason. The fight avoided for now, Talon points out that he has left Vance in good hands. 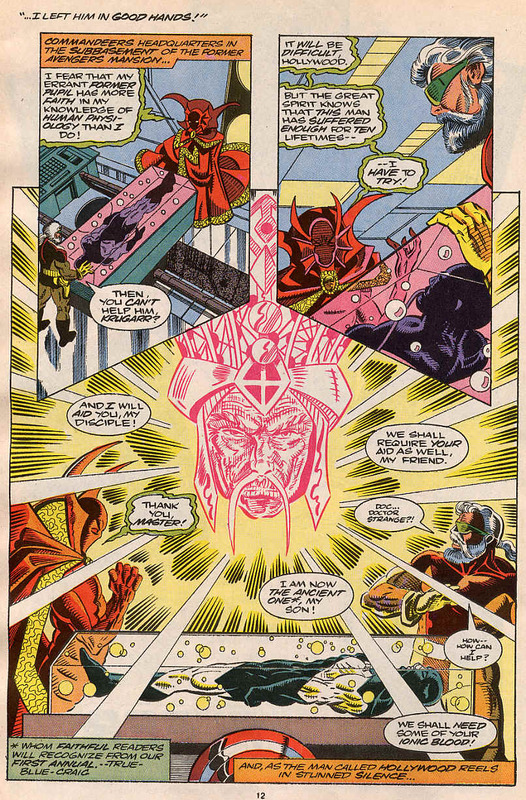 The scene shifts to Comandeers headquarters where Hollywood is joined by Krugarr and the astral form of the Ancient One, once known as Doctor Strange, who notifies Hollywood that some of his Ionic blood is needed. Then we’re back off to Courg. Martinex has evaded the knife and turns the tables on the Courgan native, who informs Martinex that all the devastation he can see is his fault. The Guardians drove off the Stark, but left the dead and disease followed. The Stark returned and massacred the people who survived the illness. The Courgan (who’s name was Atur, I think) tells Martinex that the never considered the consequences of actions like this and a simple show of force does not solve the problem. Martinex is visibly shaken by this. Back on Earth, the Guardians are enroute to the Realitivee refinery, people sort of pair off and there is a little bit of light hearted banter, including Tarin telling Yondu of her admiration of him. Yondu only responds with pointing out that he can hear a high pitched whine, like that of a homing device, one of the Commandeers is visibly shocked by this. Meanwhile.. Deep in the heart of the Shi’ar empire, a museum curator shows a broken piece of a familiar looking claw to Rancor and her lieutenants from issues 9-11 who quickly kill the curator. 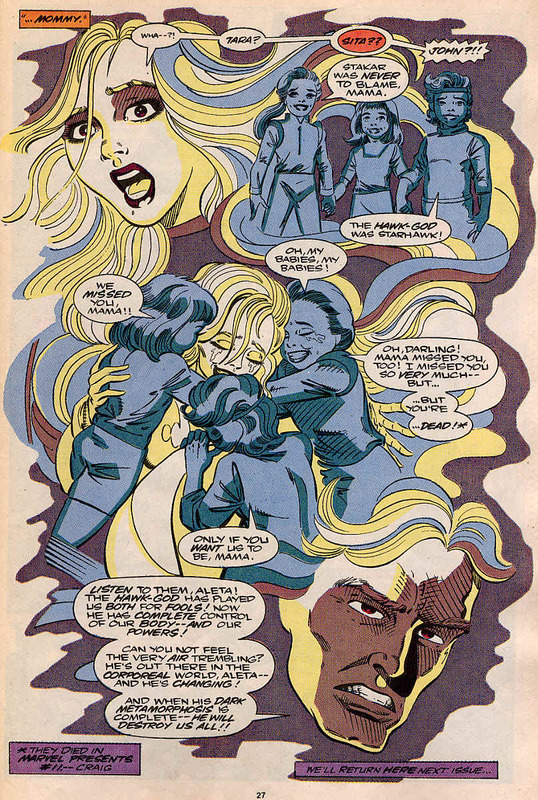 There is another scene with Aleta and Stakar, trapped in a grey void along with their children while the Hawk God changes their body. 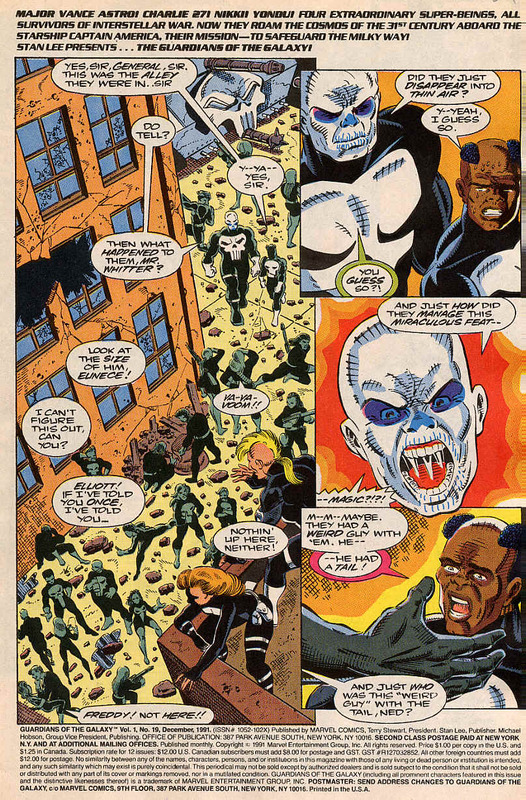 The Guardians arrive at the refinery, the only such refinery on Earth, nestled in the Bronx, far from the Punisher’s turf. The Guardians find out that brains behind Realitee-vee are in fact the Brotherhood of the Badoon. They turn and see the Punishers behind them and from within the group Belle draws her gun against Charlie-27. 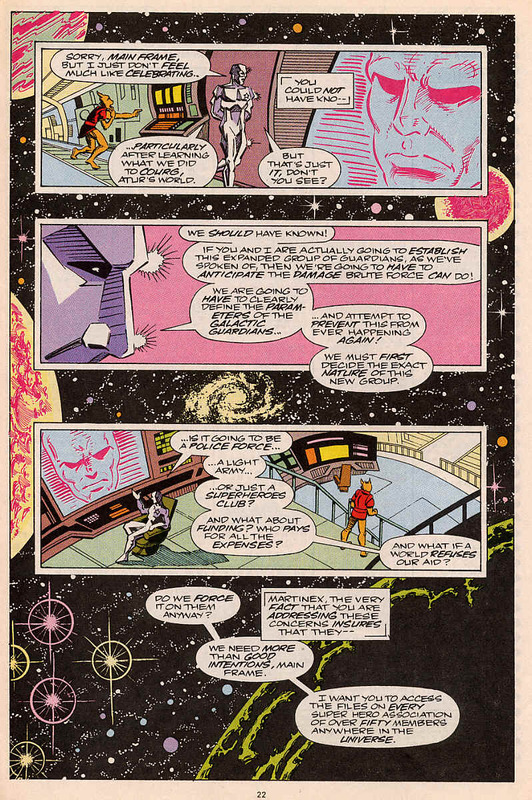 Enemies in front of them, behind them and within them, Tarin calls for the Comandeers and Guardians of the Galaxy to surrender. Above the refinery, Krugarr, Hollywood and another figure in shadow watch. The shadowed man points out that it’s up to the three of them to save the rest. Hollywood points out that there’s only 3 of them and their enemies are legion. Notes: Another gripping part of this continued return to Earth story and it looks like it’s heading for an exciting conclusion. Belle is revealed as the inside man earlier than the next to last page, but only in retrospect. 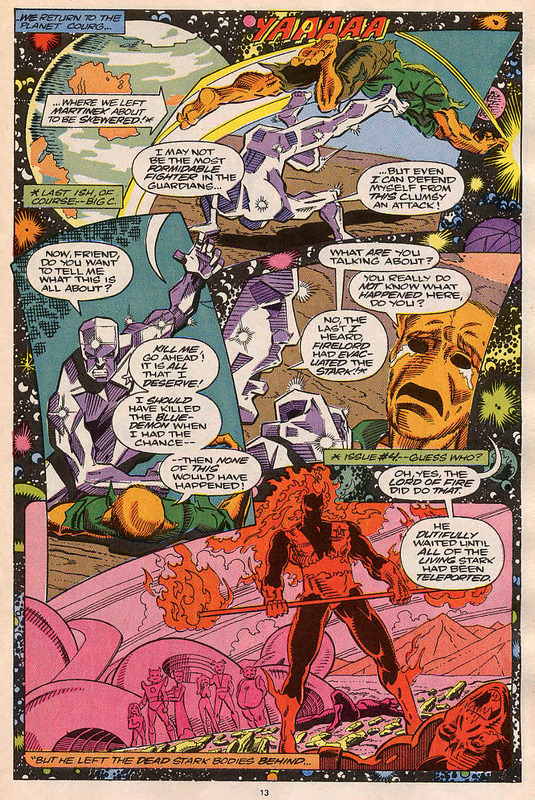 Tarin’s attraction to Yondu is brought up again, this time she tries to tell him about it. An immediate rivalry exists between the military minded Charlie-27 and the free-wheeling Talon, which adds conflict to a team that is starting to get on a little bit too well. Talon himself is an interesting character, secretive about his past, but a lot of fun and a lively addition to the story and eventually the team. 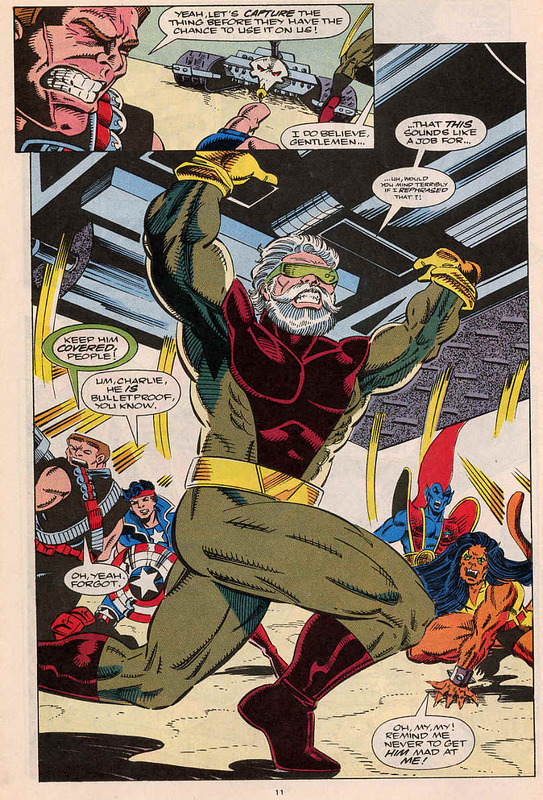 This issue takes us to the Shi’ar empire, the Shi’ar are bird-like aliens long associated with the X-Men and have been both friends and enemies to them, depending on who’s in charge and what threat the X-Men and other humans pose to them. 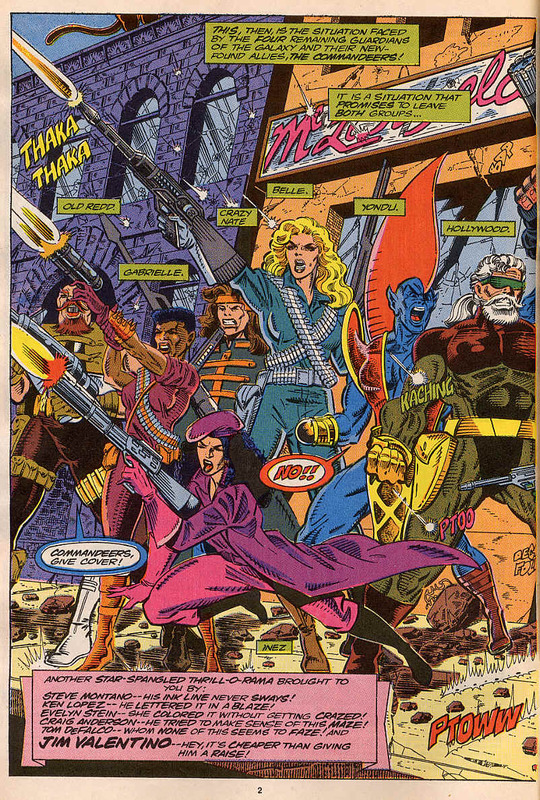 The Shi’ar scene tells us that the Mutants of Haven will make a comeback soon and am glad of it. 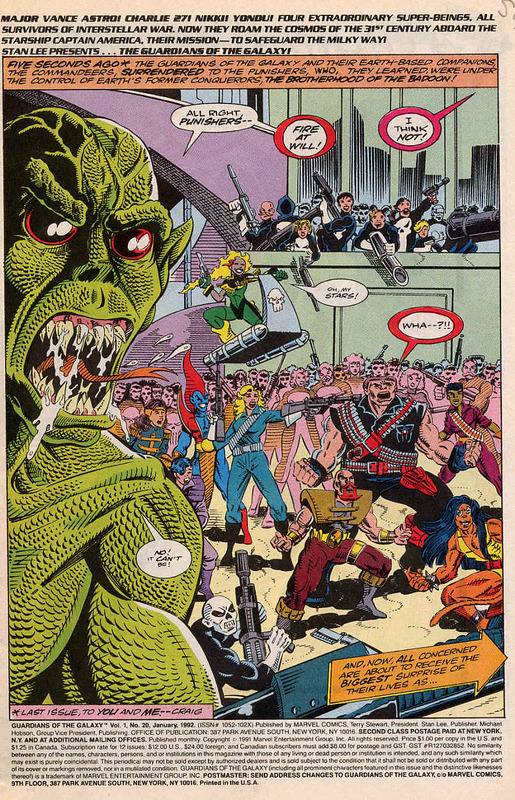 The Badoon are back, it only took 19 issues but they’re back in their purple speedos and flying dogs. Guardians of the Galaxy 18 was cover dated November 1991 and was on sale in September 1991, sharing the spinner racks with Black Canary #1, Conan the Barbarian #250, Doom Patrol #48, Excalibur #43, O.M.A.C. 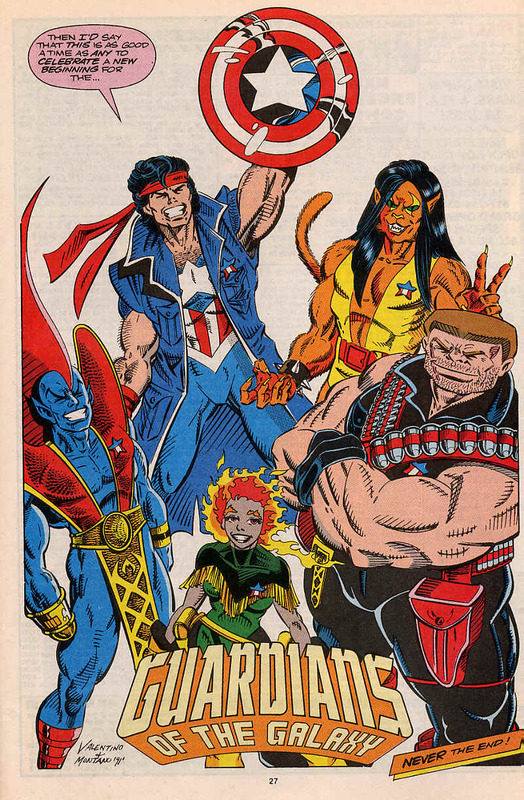 One Man Army Corps #1 and Quasar #28. Punished was written and drawn by Jim Valentino and inked by Steve Montano and opens with a quick recap of recent events and then Vance gets shot. 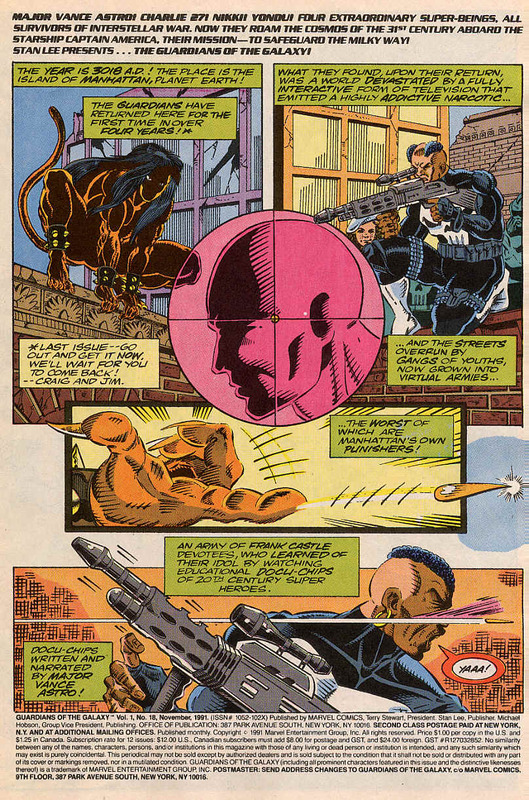 The two teams (Guardians and Comandeers) find themselves under fire from the Punishers who shoot at them and a furred individual who fired some kind of dart at the lead Punisher, the main reason it seems that Vance’s head wasn’t removed, as it is, the bullet penetrated the adamantium sheath that has covered Vance’s body since the early issues of this title. Taking the initiative, Charlie-27 orders everyone to fire back, his own cannon destroying the building that the Punishers were firing from, giving the team room to escape and seek medical aid for Vance. Back in New York, a Punisher squad ambush Yondu, Old Redd and Inez and Inez is shot and killed by a smirking Punisher, who comments on it being worth a “Double Bonus”. 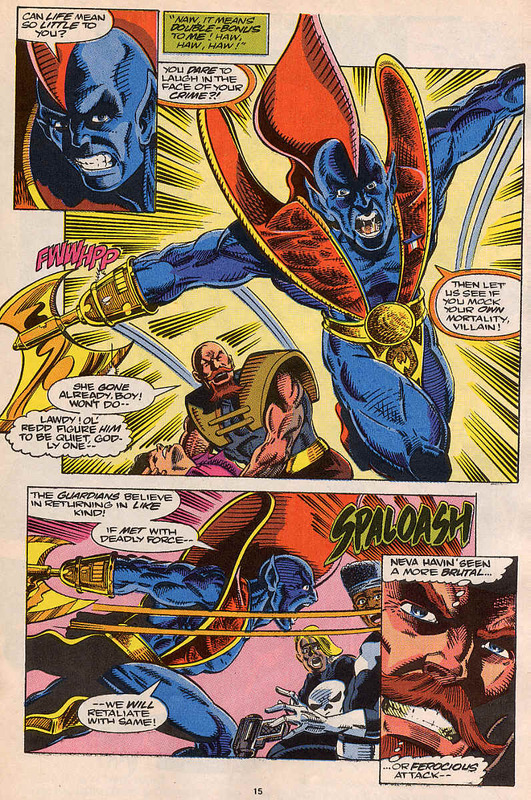 Yondu goes bezerk and summons a battleaxe from his new weapons stump and (partially off panel) decapitates the Punisher. While Nate & Nikki plan to take out a flying Punisher, a furry man with a tale lands in the window of a building in Greenwich Village. 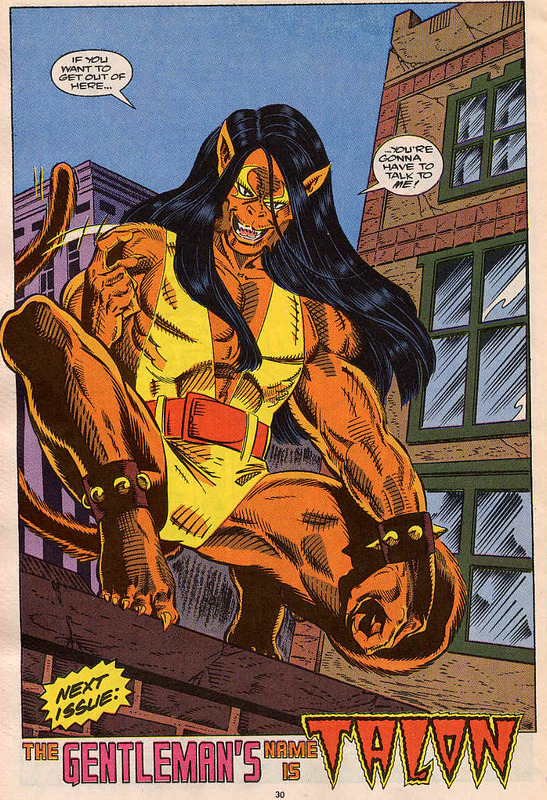 The furry man (called Talon by the house’s resident) tells the man inside that he needs help for the Guardians and Comandeers. Then back to action. Charlie-27 has caught up with the original shooter and batters him into the wall, while Nikki has taken out the flier and flies on a captured flying device and helps Nate, who is shot at and his eye is damaged. 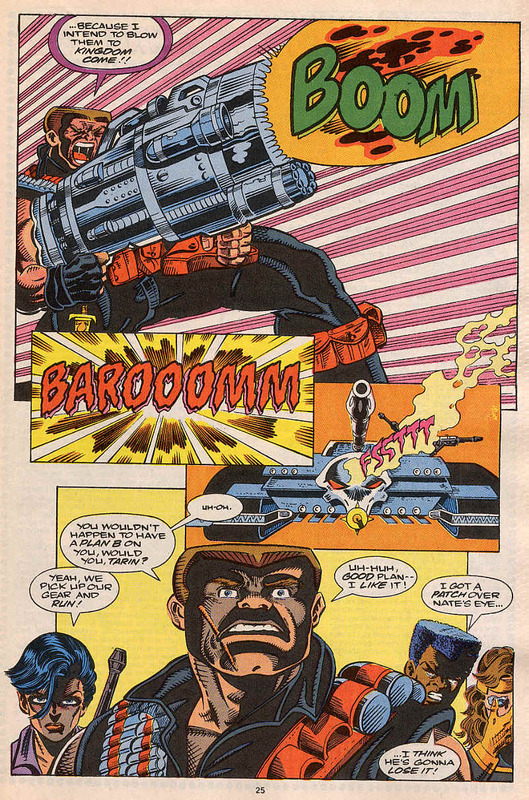 As Charlie is finishing punching Vance’s assailant through the wall, a tank called the Ultimate Punisher arrives on the scene and Charlie quickly fires at it using his cannon, with zero effect. 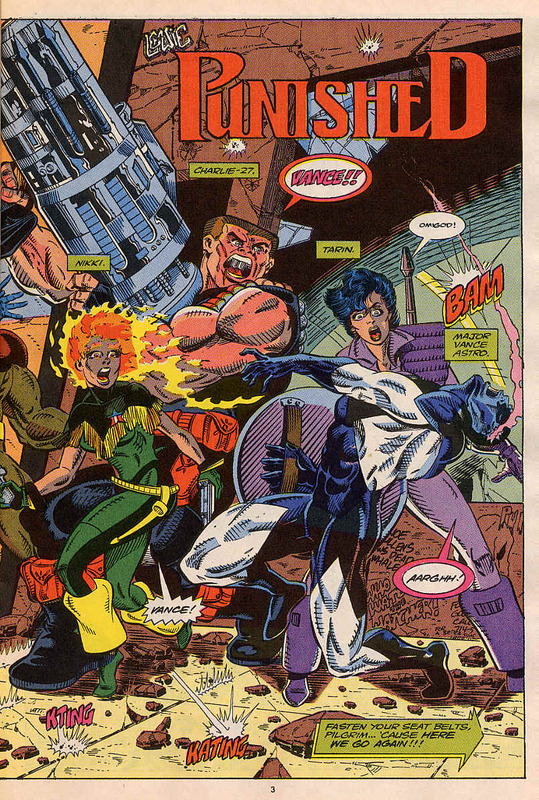 The team retreat as Tarin comments on how badly the last two issues have gone, giving a nice segue into looking at Vance Astro, now lying in a vacuum chamber guarded by the Commandeer named Hollywood. 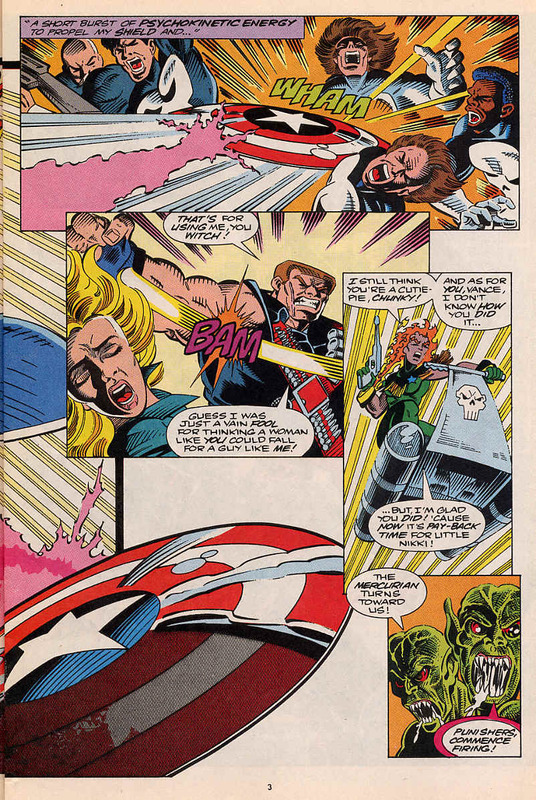 Hollywood thinks about how Vance is quite conceited to wear Captain America’s shield into battle, but says that if it was in his power, he would not let Vance die. 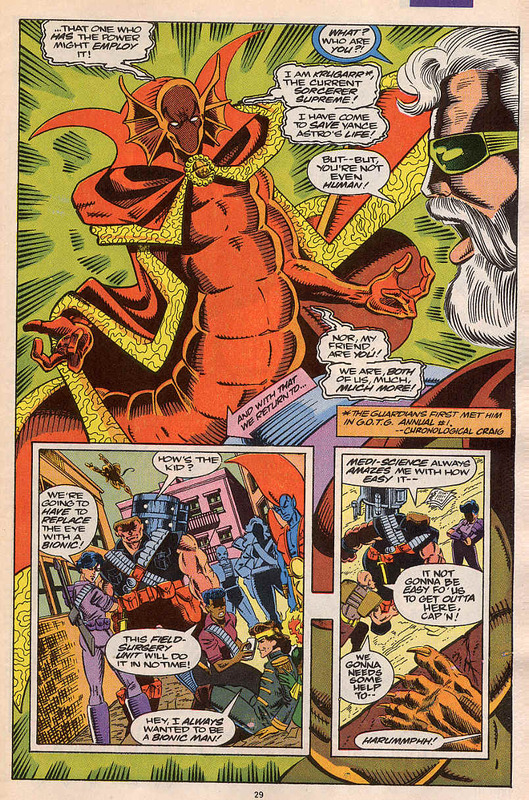 Then as if answer, Krugarr the sorcerer supreme appears before him and announces that he is there to help Hollywood save Vance Astro’s life. 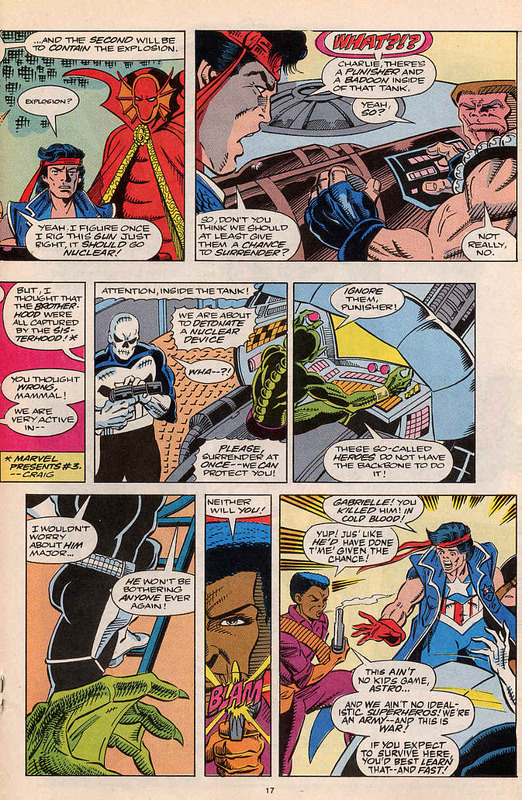 As the remaining heroes gather together and wonder how to get out of all this, help arrives in the form of Talon, the cat man from earlier in the issue, who in a very Mad Max way points out that they need to talk to him to get out of there. Notes: This is the first full appearance of Talon, who will stick around for quite a while and the welcome return of Krugarr. This is a fun issue, very much a middle of the action story, with the heroes seperated and under threat, kinda reminding me of Empire Strike Back in a way. Both Yondu and Tarin have prosthetics and it looks like Nate’ll need one by next issue. Yondu shows a great degree of savagery in his dispatching of one of the Punishers. Yondu is considered a primitive, or a barbarian, with his aversion to technology and his acceptance of lethal force in combat, but he’s always been shown as a very civilised and calm person, so this savage beheading is very much out of character as Old Redd notices. One thing that bothered me was that it’s the 31st century, so why are people still using bullets? 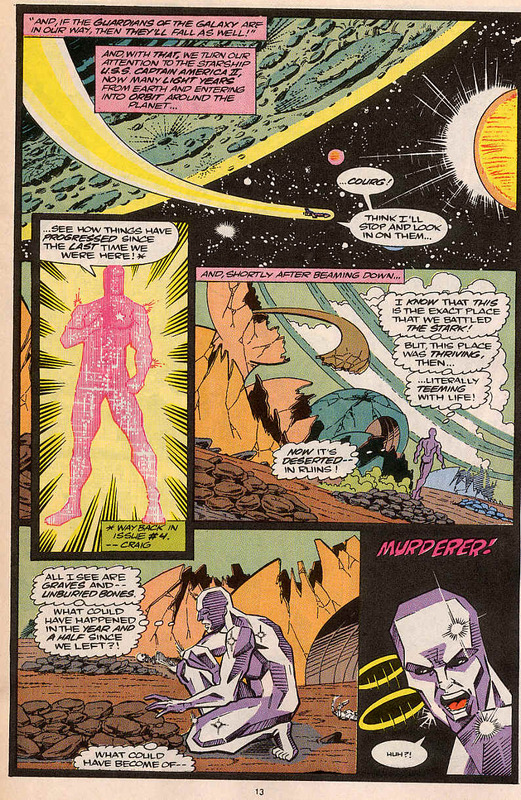 Even after the fall of human civilisation in the wake of the Badoon, howcome lasers aren’t the norm? 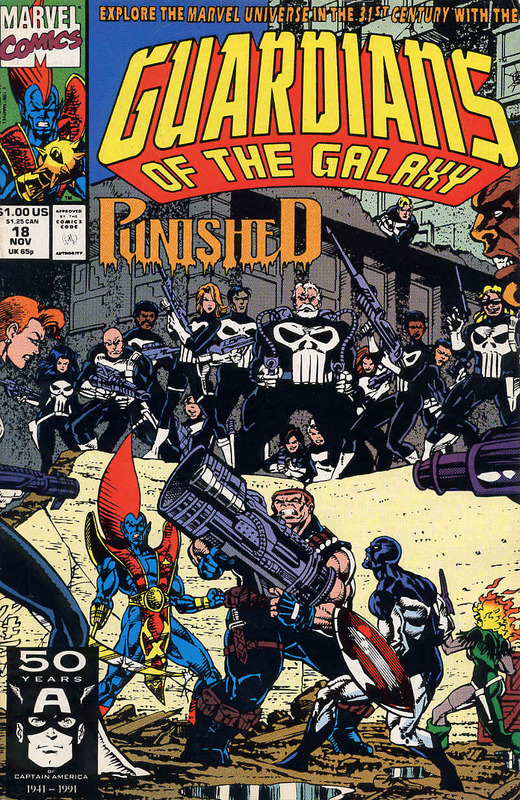 Next Time: The Gentleman’s name is Talon, the Punishers and some old enemies.